Opposition members call for elections following Foreign Minister's remarks that going to the polls is better than releasing terrorists. Members of the opposition said on Sunday evening that if Foreign Minister Avigdor Liberman wants elections, he should get them. The opposition members were responding to comments Liberman made at the Jerusalem Post conference, where he said that he preferred to leave the coalition and force new elections instead of having Israel agree to release more terrorists. 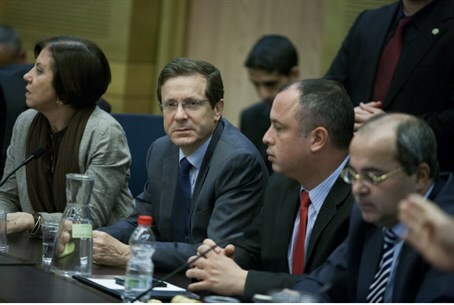 "Given the ongoing failure of the current government in every field, new elections are not a threat but a hope," opposition leader MK Yitzchak Herzog (Labor) said in response to Liberman’s remarks. "Liberman removed the mask and returned to his old job," he added, "Accordingly, I expect [Finance Minister] Lapid and [Justice Minister] Livni to draw the obvious conclusion and leave this coalition." MK Zehava Galon, chairwoman of the leftist Meretz party, also welcomed the idea of new elections. Liberman, claimed Galon, revealed the true face of the Israeli government. His comments, she added, revealed that Israel is responsible for the peace talks reaching an impasse. MK Omer Bar-Lev of the Labor party responded to Liberman’s claims that Israel had three options for solving the crisis in peace talks: forming a new coalition, releasing terrorists or holding elections. “With a little creativity, the Israeli leadership would understand that there is more available than these three options, but if Liberman says he does not want the first two, the government has no chance of advancing the peace process and it would be better to go to the polls and the sooner the better,” he said. Meanwhile, sources close to Prime Minister Binyamin Netanyahu played down Liberman’s threat on Sunday evening. “Yisrael Beytenu is unlikely to leave the coalition in the foreseeable future,” the sources said.